How Can We If Our Pet is in Pain? Different species show pain differently. Because dogs and cats show pain differently than humans do, a lot of people have concluded that animals don't feel pain like we do. In fact, in the old days, it was actually taught in veterinary schools that animals did not feel pain! Yet at the same time the anatomists and the physiologists knew that animals' nervous systems are just like ours. The nerve endings function in the same ways our do. There have been studies done comparing animals and humans in pain threshold tests, and they found that animals feel pain at the same stimulation levels as humans. "No, he isn't whining so he must not be in pain." "No, he is still eating so his tooth must not hurt him." "No, she's a little stiff but she still wants to play." When they don't, we often conclude that they must not be in any pain at all. Think back to the last time you were in pain. Did you moan continuously? Probably not, but you were nonetheless in significant pain. Remember when you had your wisdom teeth out? It hurt, didn't it? But you did not quit eating. Anybody have arthritis? I do, but I still enjoy many activities even though it hurts a bit. Also, we often expect animals to show pain in ways that are contrary to their nature. It is instinctive for animals to hide their weaknesses, not to bring attention to them. In the wild, an injured wolf that whines will attract predators like a garbage truck attracts flies. It would be suicide in the wild for an injured wolf to whine or cry out, so they don't. For example, we expect animals with dental pain to quit eating, because that is what we think we would do (even though we don't). But a wolf with a broken tooth that stops eating rapidly becomes a thin, weak, mal-nourished wolf with a broken tooth and becomes a prime target for predators. So they continue to eat through the pain. We now know that it is absolutely true that animals feel pain just like we do: They just show it differently. 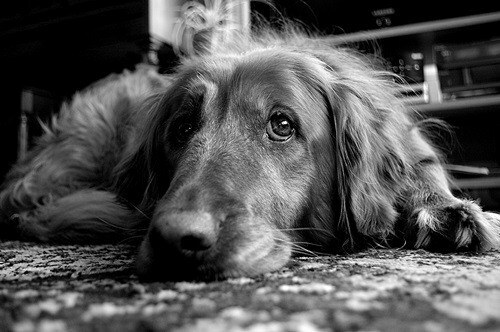 A veterinarian related this personal story of how his own dog showed pain. In this case, the dog damaged a tooth. The tooth wasn't knocked out or broken, but it had sustained an injury known as pulpitis, where the sensitive pulp inside the tooth is damaged by trauma. The injured pulp bleeds inside the tooth, causing the tooth to change color. The veterinarian relates: "In 1983 my dog Mutley was playing tug of war with our youngest son. Mutley yelped out and we watched his tooth turn pink. He completely went off feed for one day. And for the next few days went from the alpha dog in the family to the bottom of the pack. The other dogs would push him away from his food bowl and he let them. The next week I did a root canal on the tooth and the following day he went back to being the alpha male." 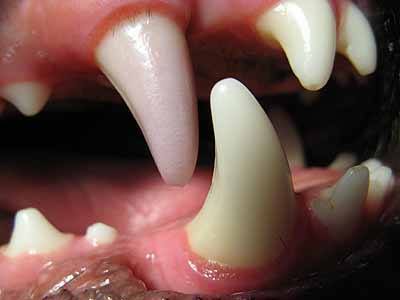 This dog was experiencing severe dental pain, yet he showed only subtle signs. He only quit eating for one day. He showed no other sign of tooth pain that the veterinarian could identify, except that he was bothered by the pain so much that he could no longer defend his status in the pecking order. As soon as the pain was relieved by the root canal therapy, he immediately became top dog again. So How can we tell if our pets are experiencing pain? There are two ways. One is by careful observation, as we have outlined above. The other way is by logic. We know that the "hardware" of the animal nervous system is identical to ours. We can therefore expect that things that cause us pain will also cause pain in our pets. Just because they do not show pain in ways that we expect them to show pain does not mean that they are not feeling pain. At Sunnyside Veterinary Clinic, we believe that surgery hurts, and that animals can be in significant pain for several days and not show dramatic signs of their suffering. That is why we treat all surgical and injury patients as we would like to be treated, with plenty of effective, safe pain medication.